Today, the city of Maiduguri occupies a very prominent place in Nigeria as the administrative and economic capital of Borno State, North Nigeria. Yet this rise to dominating importance is of relatively recent origin, beginning only in the wake of European colonial intervention in the area of Borno following the Rabeh war at the very end of the 19th century. On the other hand, due to its favourite geo-economic position, the place nowadays occupied by the sprawling Maiduguri has been settled for far longer and developed into an important market site, at the hub of a far-ranging trade network and part of the important kingdom of Kanem-Borno. Despite the apparent importance of Maiduguri and its predecessors, the scientific literature, as well as information in general, about the city, its history and environs is surprisingly sparse or even misleading. It is this fact which sparked the beginnings of this volume of collected papers, representing the first attempt to gather contributions from a plethora of disciplines concerned and dealing with Maiduguri. 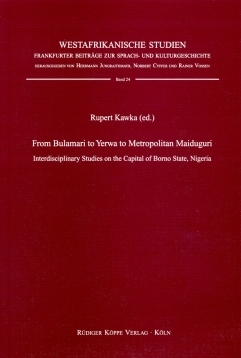 The contributions to this text collection originated in the context of the Collaborative Research Center 268 Kulturentwicklung und Sprachgeschichte in der westafrikanischen Savanne of the universities of Frankfurt/Germany and Maiduguri/Nigeria, sponsored by the German Research Foundation (DFG). Durch die Darstellung der unterschiedlichsten Aspekte der Stadtentwicklung wird ein Bogen gespannt von der Bedeutung der Handelszentren des Reiches Kanem-Borno bis zu Problemen der Gegenwart. [...] Insgesamt ein interessantes Buch, das dem Leser die Möglichkeit bietet, sich umfassend über die Vielfalt der Stadt zu informieren.